Featuring a Christmas-themed design with Santa, available now is the tenth release from the Royal Canadian Mint’s series of commemorative $20 silver coins that are sold at face value. It is the second holiday-themed release with last year’s coin launched around the same time depicting a reindeer. 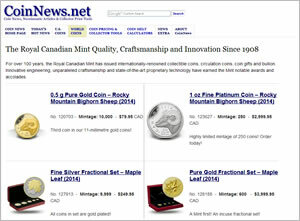 All nine prior editions sold out, suggesting that the new Canadian 2013 $20 Santa Silver Coin will eventually sell out too since collectors like a complete collection. Plus, there is less to lose in paying $20 for a coin that has a legal tender value of the same amount. The Santa commemorative coin has a mintage of 225,000, matching that of the prior $20 Iceberg coin. The lowest mintage belongs to the very first 2011 $20 Maple Leaf silver coin at 200,000. The seven coins in between each had mintages capped at 250,000. Designed by Jesse Koreck, the reverse or tails side features an image of Santa holding presents. 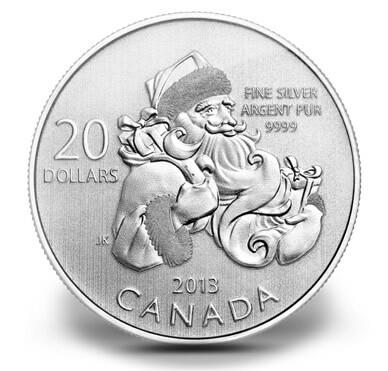 Surrounding the jolly-bearded guy are inscriptions with the coin’s face value of ’20 DOLLARS’, its purity of ‘ARGENT PUR FINE SILVER 9999’, ‘CANADA’, ‘2013’ and ‘JK’ for the designer’s initials. Found on the obverse or heads side of every $20 for $20 coin is Susanna Blunt’s portrait of Queen Elizabeth. Encircling inscriptions include ‘ELIZABETH II’ and ‘D.G. REGINA’. There are no edge letterings as these coins have serrated edges. All $20 for $20 coins are minted in 99.99% silver and produced to a weight of 7.96 grams and a diameter of 27 mm. The coin’s weight and purity account for a bit over one-quarter troy ounce of silver (0.255919943 ounces). Using the latest silver spot price of $21.22 an ounce, each coin has a current silver melt value of $5.43. That is up about 50 cents from when the Iceberg coin debuted in July. Conversely, the very first coin launched in 2011 when silver was hovering near $30 an ounce. Its debut melt value was near $7.70. For reference, the three coins from this year are linked to the coin news article announcing their release. Canadian 2013 $20 Santa Silver Coins are available directly from the Royal Canadian Mint’s website at mint.ca. 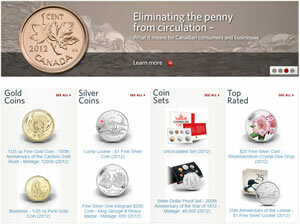 Its more recent $20 silver coins are listed here. They sell at face value and are GST/HST/PST tax exempt but the Mint does charge for shipping and tax on shipping does applies.